Here’s one way to ensure your vanilla extract is certified gluten free vanilla extract. Make it yourself—it’s so easy! There is no other scent quite as intoxicating and seductive as that of the vanilla bean. Capturing the essence of this precious fruit for use in baking is remarkably easy to do at home—DIY and gluten-free. 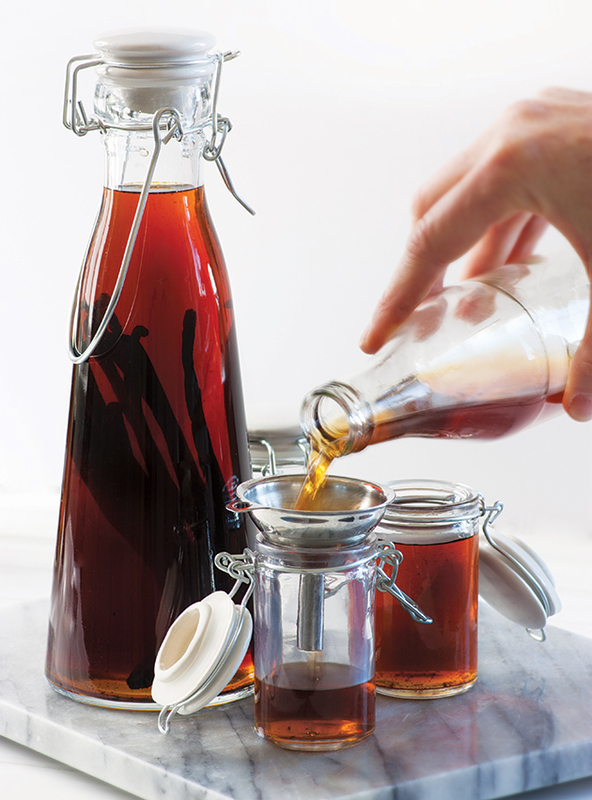 With two ingredients and a little patience, you are on your way to making pure vanilla extract. Quality vanilla beans may be sourced from finer cooking stores and online. At www.beanilla.com, you will find a wide selection of Mexican, Madagascar, and Tahitian beans both in Grade A (for baking, drinks, and desserts) and Grade B (for extract making). And then there is always Amazon (affiliate link). Five beans are required per 1 cup (250 ml) of alcohol. Use a knife to split each bean in half, leaving about ½ inch at each end intact. Place vanilla beans in bottle and cover completely with vodka. Close and store in a cool spot, giving the bottle a gentle shake every 2-3 weeks. After two months, the extraction process is nearly complete and you may begin to use the extract. Remove beans, strain (if desired), and bottle to give away as gifts—or keep it all to yourself! Most authorities say that people with celiac disease can safely consume distilled alcoholic beverages, even those crafted using gluten grains. That’s because the distillation process supposedly removes all of the gluten protein molecules responsible for a reaction. However, the Celiac Sprue Association does not necessarily agree. When it comes to distilled alcoholic beverages, the association recommends celiacs consume only spirits crafted from non-grain sources and in dedicated gluten-free facilities. Wow, did you take that amazing picture Lex? I'm looking for a way to make an alcohol-free vanilla extract. Any ideas? Looks awesome, Lexi. I really need to try this. Pinning! In other tutorials that I've read on this it mentions you can refill the bottles when they get low and start over. Have you done this or do you start completely over with new beans each time? And if you do reuse the beans any tips or is it just the same as instructed here, maybe with just a little longer of a extraction process? Thanks! I found these at Hobby Lobby I think. They are glass (which is BPA free 🙂 and the tops are ceramic and the rings are rubber. Have no idea if the rubber is BPA free … but the extract does not come into contact with anything but the glass. Hope that helps.